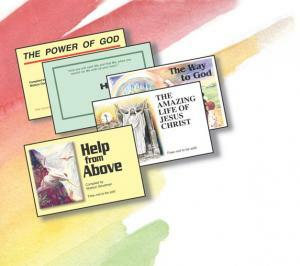 World Missionary Press was raised up by God in 1961 as a support ministry to provide Scripture booklets in many languages for FREE worldwide distribution. Located in New Paris, Indiana, WMP prints millions of 48-page topical Scripture booklets EACH WEEK for destinations around the world. Booklets have been printed in more than 340 languages and sent into 210 countries. Jesus said, "Give ye them to eat." He multiplied what was in hand and given to Him, so that it might be distributed strategically to the hungry multitudes, which Jesus saw as "sheep without a shepherd." He instructed His followers to pray to the Lord of the harvest to send laborers, because the "fields were white unto harvest." In many cases, these little booklets containing prayerfully selected portions of God's powerful Word are considered "paper missionaries!" Certainly thousands of workers in the harvest fields of the world clamor for them as "seed for the sower"—tools that God's Holy Spirit can use in their home-to-home and public outreaches as well as in their follow-up and church-planting endeavors. God can continue to do His work through these "paper missionaries" anytime and anyplace wherever they have been planted. These "Word-containers" can continue to provide spiritual food for believers and unbelievers alike, and especially for those who may never own a Bible or have access to God's Word. We strongly believe that the fruitfulness of all of this God-initiated activity around the world is MULTIPLIED by the upholding prayers of those whose hearts God have touched to PRAY. As God provides increasing resources to enable increased production and shipping of His Word, INCREASED PRAYER IS ESSENTIAL to cover all aspects of the work. Obstacles can be removed. Satan's attacks can be thwarted. BELIEVING GOD is the greatest work for God that YOU can do! We will provide you with general guidelines on how to pray for World Missionary Press as well as current specific requests and answers to prayer as we learn of them. PLEASE remember, you are COMMITTING to PRAY during one particular hour every week, if possible. With contacts in every time zone, we are eager to see this Wall of Prayer grow to a 24/7 prayer covering of WMP activity around the world. Please encourage others to join their prayers with ours. You will need to sign up each year.